Are you the kind of person to shoot first? Beautiful miniaturized version of Han Solo's iconic blaster pistol! The pendant necklace includes a 30-inch chain. Exquisitely detailed stainless steel with a golden finish. 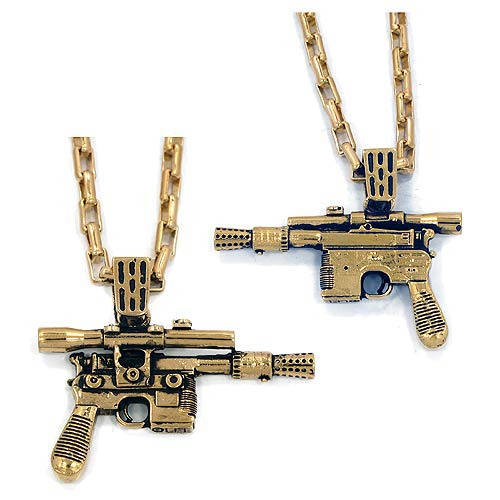 If you're the kind of person to shoot first, this stunning Star Wars Han Solo's Blaster Golden Pendant Necklace is for you! Made from stainless steel with a golden finish, and featuring intricate antique details, it's a beautiful miniaturized version of Han's iconic blaster pistol from the Star Wars trilogy of movies. This terrific necklace will bring out the anti-hero within you! The pendant measures 1 7/8-inches long x 1 1/4-inches tall and comes on a 30-inch chain. Ages 15 and up.